Let's put the brushes down and press pause on our YouTube makeup tutorial videos and let's take a moment to laugh our little heads off at some of the best makeup fails (my favourite past time). You probably won't complain again about not being able to create a smoky eye after taking a look at these lot! 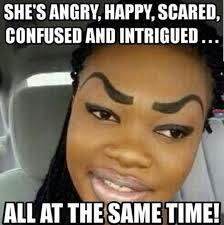 FAIL No1: BUST UP BROW'S. The ever growing trend of the perfect brow is screwing with people senses and this is the by-product... skinny/shaved one line brows vs. the bad man brow that's big enough to win 3 rounds in a boxing ring. Come on Xtina love, we can all see you're going for a 20's vintage look but those brows are taking you back to your 'DIRRTY' days. FAIL No2: POWDER FACE. Not many of us regular folk use or even know what translucent powder is, however it is a firm celeb favourite and is a staple item for finishing off your red carpet look, however with these lot it looks more like they've been showered with flour rather than the affections of their fans. Looks like one of Angie's 20 kids was let loose with a bag of self raising! FAIL No3: EYE SHAD-OW NO YOU DIDN'T! We all like an experiment now and then with a Rimmel quad but this gang looks like they've got the Crayola look rather than the London Look. Tara took the 'Smize' to a whole other level with this look and Claudia needs to strictly go home. FAIL No4: FOUNDATION FLAWS. We've all been culprit of the 'tide line' once or twice at some point however repeat offenders and intentional offenders are simply offensive. These lot look like their shades of foundation have taken inspiration from David Dickinson and Ronseal combined. The lass on the left looks like she's tried to change ethnicities! ORANGE YOU GLAD YOU DON'T LOOK LIKE THIS?! So there we go, my top makeup fails! I hope this has brightened up your day as much as it has mine. So the next time you feel like a makeup failure just think back to this and remember that you haven't mucked up as much as this bunch!